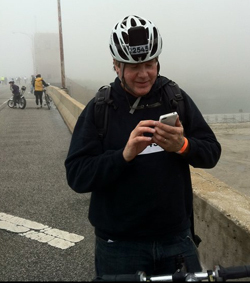 Chicago's "Bike the Drive" took place this past Sunday, May 29th and though Lake Michigan was shrouded in fog and mist, the most violent thunderstorms held off until the afternoon, preventing a total washout. The ride has been held annually since 2004, with Chicago's main lakefront thoroughfare being closed to motor traffic the Sunday morning before Memorial Day. Riders start out at the intersection of Columbus Blvd. & Randolph Street in the heart of the downtown area and can choose to ride just the south leg to 57th Street , the north leg to Hollywood, or both, a distance of about 30 miles round trip. A pavilion with bands and food is set up in Grant Park for riders or spectators and volunteers supply food and bananas at rest stops at either end of the route. This year, in preparation for the glorious view of the lake which wasn't to be, I rigged up a "helmet cam" using my iPhone and a holster carrier. I used the app Timelapse Pro to shoot the video, which worked out pretty well, though I could have done with a rain visor for the iPhone. By the time we finished with the north route, the south leg was closed, which was just as well since the rains began shortly afterward. The ticket price of $45 ($55 if buying on the day of the event) goes toward the Active Transportation Alliance to promote bicycling safety and advocacy. This year marks my second year taking part, and though the weather could have been better, I was happy that both my kids joined my wife and me this time around.